The couple got married at the Mandalay Bay Resort by the Waterfalls. Like many Strip Hotels, Mandalay Bay doesn't allow outside photography during the ceremony. After taking getting ready pictures we continued the photography coverage after the ceremony. There was a little hick ups with the reception room. The couple booked a penthouse suite at Palms Place for their reception. Unfortunately the room was on the bride's name. The hotel didn't provide the key for anybody else. We had to cut short our portrait session, since the couple had to go the Palms Place to pick up the key and let the vendors into the suite to get ready for the reception. The suite at Palms place has an amazing view of the Strip, so we took pictures of the couple, the wedding party and the guests after arriving to the hotel and during the reception. 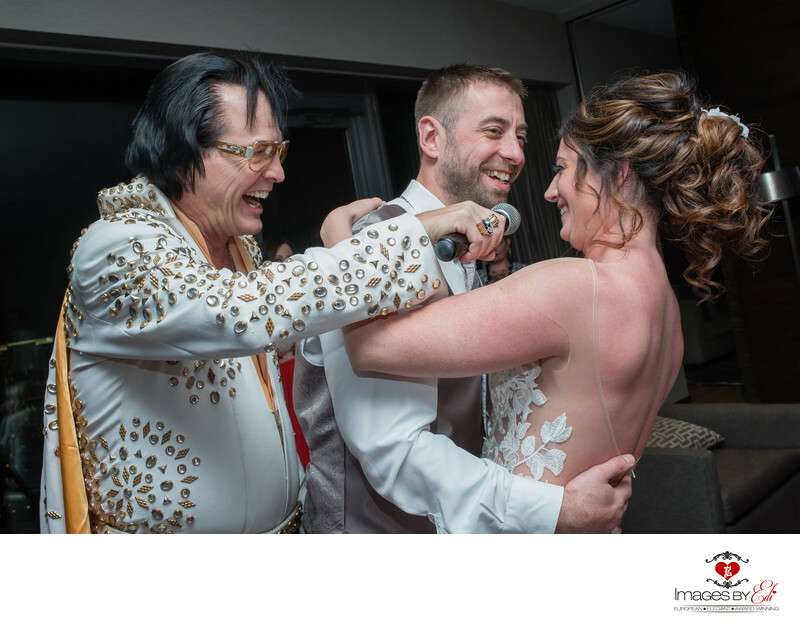 The couple also surprised their guests with an Elvis impersonator during the reception. A fun moment with Elvis captured on this image. Location: 4321 West Flamingo Road, Las Vegas, NV 89103.